Another blogging milepost has been reached. There have now been over 200 posts on this blog since it was started in May, 2012. For number 201, I thought I would introduce the celebration for the 200th post by sharing a little information on bilbies. At the end, there is a surprise for the class that received post 200 and something for the class one off at post 199. The lesser bilby (macrotis leucura) is thought to have become extinct in the 1950s. The greater bilby is listed as threatened. Let's learn a little about the greater bilby. From the photo, you can see their size and long ears give them a rabbit-like appearance. 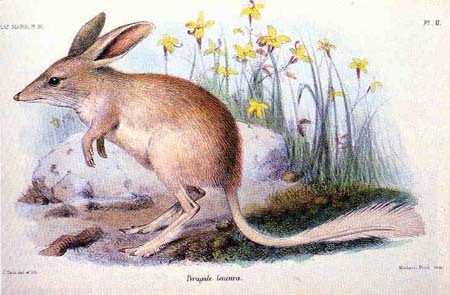 While many comment on the likeness of bilbies to rabbits, bilbies are, like kangaroos, marsupials. Bilbies are nocturnal (they come out at night) and were once found in arid (desert), semi-arid (almost desert) and some better areas but are now only found in arid areas. Greater bilbies can be 29-55cm (11-22in) in length. Males can grow up to 1.0 - 2.4kg (2.2 - 5.3lb) in captivity (zoos and animal sanctuaries) while females can grow to 0.8 - 1.1kg (1.8 - 2.4lb) in the wild. Bilbies have a good sense of smell and, as you might guess by their ears, good hearing. Like humans, they are omnivores (eat plants and animals). Their diet includes fruits, seeds, fruit, insects, spiders, and other small animals. They find most of their food by scratching and digging in the soil. Like other marsupials, their young are born (usually 1 to 3 joeys) very small (about 0.5cm of 0.25in after only 12 to 14 days) and must make their way into the mother's pouch where they attach to a teat. Bilbies live in burrows so bilby mothers have developed pouches facing backward to stop soil getting in or babies being knocked out. Young bilbies leave the pouch after about 70-75 days. A female bilby can have up to four litters per year if conditions are good. There are zoos and animal sanctuaries with bilby breeding programs in Australia. 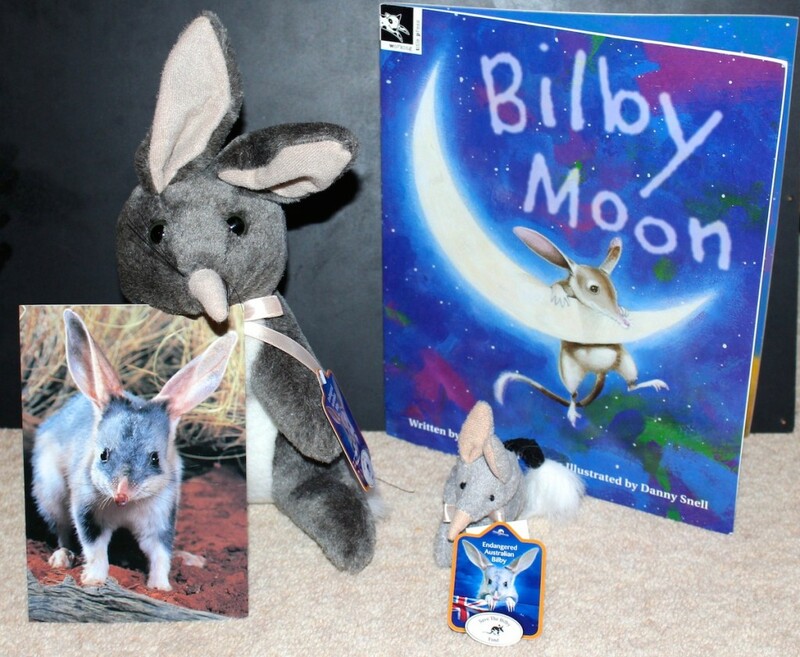 Possibly the most famous bilby has been named George. He lives in Taronga Zoo's Prince George Bilby Exhibit in Sydney and was given the name in honour of the young Prince George when he visited the zoo with his father and mother, Prince William and Catherine, Duchess of Cambridge. 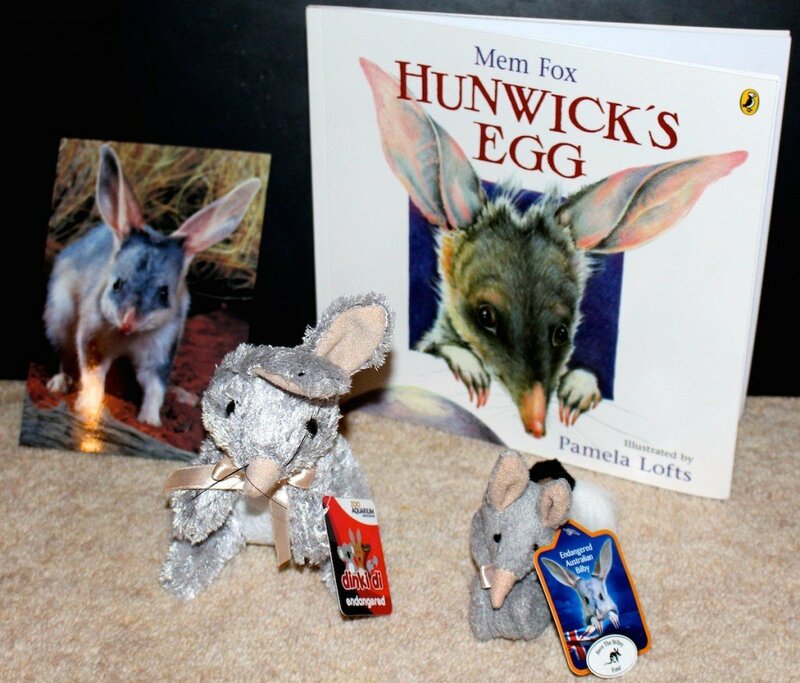 In 2014, I shared some information with a class about bilbies at Easter time and the sale of chocolate bilbies to help support the Save the Bilby Fund. Easter has passed again but I wanted to support the Save the Bilby Fund yet again this year. 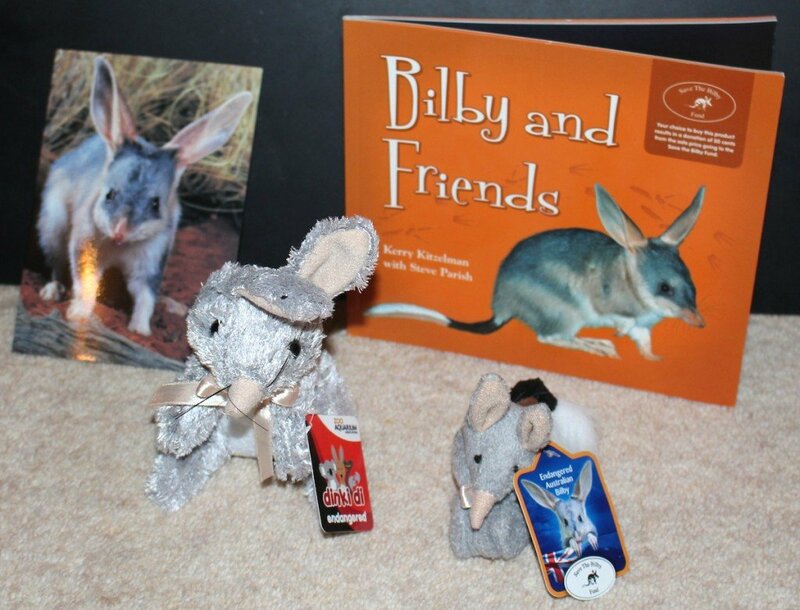 With the 200th post on this blog approaching, I thought I might buy some of the Save the Bilby Fund items in order to give the class receiving the 200th as well as some items for the classes one off at the 199th and 201st posts. The 199th post class will receive the pack pictured below with a smaller bilby. Your class missed out on the 199th or 200th post? I have one extra pack pictured below. It was meant to be sent to the class receiving the 201st post but work I do for local schools and community groups has meant my time has been short and I am about to share another milestone for this blog. Any class leaving a comment for this post has the chance of receiving the pack below. You don't need to have received a post or to have ever visited this blog. You simply need to be a school class. Individual students need to ask permission from their teacher before leaving a comment because the pack will only be sent to a class not the student with the winning comment. I will randomly select a winning comment in two weeks (June 6, 2015). How do you get a post on this blog? As the name of the blog implies, most posts on this blog are written as a comment for a class or student blog post when content has caught my interest and I wish to share more than a simple comment. Others can be made in reply to a comment or question left in the comments section of this blog's posts. You can ask directly for a post on a topic but the decision to write a post depends on whether I feel I can and if I have time but the answer is usually yes if a class wants information. Posted in Animals, Australia and tagged bilby, Greater Bilby, lesser bilby, Save the Bilby on May 23, 2015 by rossmannell.